Brewed with a blend of 4 malts and western grown North American Hops. Rich amber colour, brewed to a fuller body with a hint of caramel after taste. KOKANEE Gold is available in fine establishments throughout BC, Alberta, Manitoba and Saskatchewan. The success of KOKANEE GOLD can be entirely attributed to the appeal of the liquid. The quality, the craftsmanship, the brewing heritage, the water and the unique ingredients have created a beer of the highest caliber; word of mouth has done the rest! 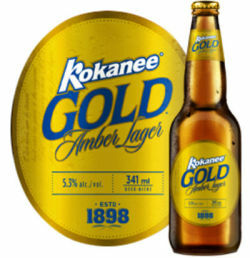 Enjoy the Smooth, rich taste of KOKANEE GOLD... a uniquely full-bodied lager straight from the heart of the BC mountains. I remember drinking this stuff when it first came out when I was 16 and even then I stopped liking it. The coppery "amber" taste in this is fairly revolting. Regular Kokanee is far superior to this, and that’s not saying a lot. Finishes extremely sour from adjuncts. Bottle at a Boston Pizza in Winnipeg. Bottle - Apple and sweet grains. Light Amber with an off white head. Light sweet brown sugary malts and a light clean finish. Light malt water and apple. Sampled at The Loose Moose in Vancouver, June 21, 2015. Sold as "Dam Amber" for some reason. Draught. Clear golden to amber color, white head. Malty, cream taste. Grainy aftertaste. Medium to fizzy mouthfeel, medium low bitterness. Malty scent. liked better than the canned Kokanee, but still not a favorite. It does have a little more malt and hop character but is still pretty boring. Slightly better than original kokanee. Has a bit of hop and malt flavours, but not a ton. Very boring beer but not awful. Draft at brewery. Is a dull sewery amber with a head that vanishes too soon, caramel and light cocoa in aroma, light soft carbo, sweet but finishes clean without offensive caramel flavors like a rickards might have. Not bad for what it is, all in all. Aroma is roasted malts, caramel and hopiness. Taste is sweet malts, caramel and toffee. Finishes with a dry yet bland maltiness. Body is a dark copper with a pearl head that retains poorly.